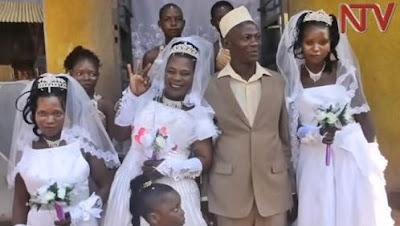 A 50-year-old Ugandan man, Mohammed Ssemanda, has wowed many and sundry after he married three women at a wedding ceremony, and quite surprisingly, the newly weds were all captured on camera, all smiles at the event. While speaking to New Vision newspaper, the groom who is a food vendor in Kasenyi landing site, a Kampala suburb, said he opted for the joint wedding with his three wives due to lack of finance to hold separate functions. He said; “My wives are not jealous against each other. Good enough, each one has got a home and I promise to work harder and support them”. The man’s first wife, 48-year-old Salmat Naluwugge, has spent 20 years with him and they have five kids, while the others are; 27-year-old Jameo Nakayiza, and 24-year-old Mastulah, who are sisters. 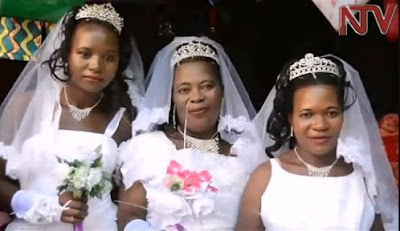 “I thank our husband for marrying us all at once, a sign that will not discriminate or sideline any of us,” a visibly overjoyed Naluwugge said at the wedding.